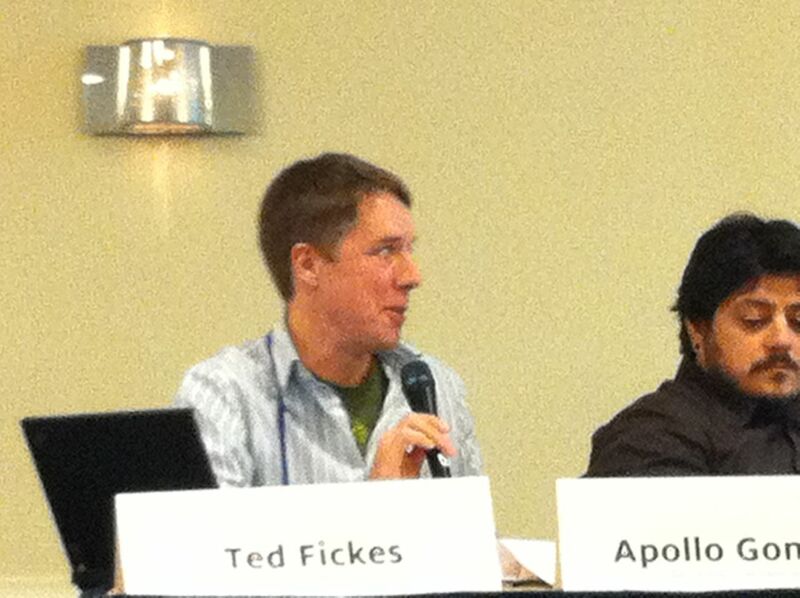 Ted and Apollo at their 'These Boots Are Made for Organizing' Panel at NTC 2011. Back in March at NTC in D.C., my BrightPlus3 colleague Ted Fickes joined Apollo Gonzales and Shayna Englin for a really interesting panel on social media and grassroots organizing (“These Boots Are Made for Organizing, Not Just Facebooking“). Apollo is doing some great social media work at NRDC, and part of his presentation focused on their use of an engagement pyramid. A number of folks have different versions of the same idea (engagement ladders are another): engage people in some very minimal way, and then slowly increase the intensity of that engagement over time. It’s a really useful model for thinking about how to initially connect with someone and then how to increase their connection to your organization, their commitment to your cause, and the magnitude of their support. But it’s a flawed model, as well, because it skips what I think is the critical prior question: what’s the point of the engagement in the first place? The theory of change idea is one way to get at this, since it forces you to be clear about what outcome you are seeking and exactly what’s required to achieve it. I tend to come at this question from an organizing perspective, starting by identifying the specific decision I want specific people to make in order to achieve that outcome, then identifying the factors that will shape their decisions, and then building a strategy around effectively influencing the right people and factors. If you haven’t answered this first, an engagement pyramid approach may well lead you astray, encouraging you to overinvest in engagement efforts that don’t effectively advance your goal and miss the critical ones. Here’s what I mean: If my goal is to persuade a member of Congress representing a rural district in the western U.S. to support a wilderness bill, then tapping people across an engagement pyramid (a large number of people sending emails, a smaller group sending personal letters, a few traveling to D.C. to meet with the Member) regardless of how many or how intensively engaged they are, is unlikely to be a successful strategy. A much more likely path to success will involve the Member of Congress hearing support for the bill from the conservative, rancher-dominated ranks that traditionally oppose such bills. Those rural county commissioners, ranchers, and other conservative rural voices don’t belong on the same engagement pyramid that you might use for your membership campaign or your “convince the City Council to create a community garden” effort . . . entirely different challenges, and the levers that can produce the outcome you want are very different. This isn’t rocket science, by any stretch – it’s really just Organizing 101 or Political Campaign Strategy 101 – but the engagement pyramid model (and all of its sibling models) would be stronger if it clearly incorporated the critical first step of identifying what, exactly, you are trying to accomplish, and what, exactly, you need in order to do so. With that critical context, it’s a lot more likely your engagement model will actually track to the outcomes you are targeting. Indeed. We knew that a lot of people were going to be talking about engagement pyramids at NTC. That, in and of itself, is a good sign. We’ve (collectively) been building great lists but not really giving people (honestly) meaningful ways to engage in the issues of the day that we cover as advocates and organizations. But, wait, here come social networks and online tools that empower people to take community action into their own hands. The expectations and needs have changed. Not everyone is just sitting back figuring that that big group in DC or San Francisco is taking care of it. So now the discussion is about engaging those people/constituents/networks in ways other than clicking to send an email (a nice on-ramp to engagement to be sure). As advocates for policy change we on that panel are fine with happy-face engagement that builds relationships and perhaps starts to change minds. This is good stuff and critical to connecting social networks to engagement pyramids for institutional strength. But what about engagement that builds towards political or social action that affects legislation? That takes time, planning, strategic effort and, yes, thoughtful goals that help identify the right people and connect them to the right targets. To be fair, throwing too much into one model risks obscuring as much as illuminating and the main point of that original engagement pyramid article was to try to frame a deeper range of engagement than many were talking about back then – one that spanned online to offline. One additional point to build on what you are saying here. In that original article, I almost included some references to the idea of engagement roles – which act as a kind of link between logic models and engagement pyramids. You can think of each of the organization’s main engagement roles having their own pyramid. You don’t want to go too crazy with this stuff because the complexity can easily overwhelm. The key is to start with just the very most important roles that the organization needs filled and then add more over time as the organization masters engagement in those initial roles. Thanks for the comments! No doubt, Jon, Groundwire really gets the connection, and Gideon’s point is a good one, too, about how easy it is to end up with overly complex models that don’t add much value as a result. It might be nice if there were a simple way to embed that question – what’s the purpose – into the pyramid, so that the increased complexity is minimal but the model itself still reminds about the importance of being clear on the point before diving into the engagement strategies. I wonder, also, if we can’t come up with a better moniker to describe logic models and theories of change, neither of which are very intuitive and both of which sound pretty wonky. In addition, “theory of change” is sometimes used to mean something much more complex than I think it necessarily needs to, which itself has spawned a sort of odd debate among the philanthropy folks about whether funders should demand them of grantees or not. It’d be nice to have some language that intuitively and clearly illuminates what we mean: a clear understanding of how pushing these levers will produce that outcome. Your points are all well taken, in any case, and thanks for the link, Gideon – nice piece. I agree, it has been dawning on me lately that we are probably not using “theory of change” in the same what that grantmakers are. I’m aware that there’s a whole fight about this in the foundation world, which quite frankly, I just don’t understand. We’ll do some thinking about how we could surface that a bit more clearly in the engagement pyramid, but in the end, I think that figuring out your (lightweight) theory of change is a separate, precursor step. Sure, you could build an engagement pyramid without one, but it would probably be weak. Yup – agreed. A lightweight and more accessible theory of change-type idea would be helpful. We’ll bat around thoughts until we find something that makes sense.